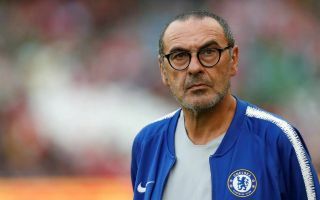 Chelsea take on Man City in their Community Shield showdown on Sunday with Maurizio Sarri aiming for his first piece of silverware in England. The Italian tactician replaced compatriot Antonio Conte this summer, and naturally will be eager to make a positive impression against the reigning Premier League champions. For Pep Guardiola, the quest to build on their success from last season begins and he’ll undoubtedly hope to develop a winning habit for his side in order to add more silverware to their collection. With regards to the line-ups, summer signing Jorginho starts in the Chelsea midfield having impressed in pre-season, and Callum Hudson-Odoi gets the nod having also stood out in Chelsea’s preparations. Alvaro Morata will be looking to put a difficult first campaign with the Blues behind him, having scored just 15 goals in 48 games in all competitions, as Sarri has placed his faith in him to lead the line on this occasion. As for City, summer signing Riyad Mahrez starts but Guardiola’s isn’t at full strength with Claudio Bravo between the posts for Ederson who starts on the bench along with the likes of Vincent Kompany and Gabriel Jesus. While the importance of winning the game is often questioned as the season opener in a friendly outing, it will certainly be a boost for the winners at Wembley with the Premier League campaign just a week from getting underway. Here is the Blues’ starting 11! ? Your @HaysWorldwide #cfcvcity, Community Shield line-up!